The ancestors of today's crocodiles colonised the seas during warm phases and became extinct during cold phases, according to a new Anglo-French study which establishes a link between marine crocodilian diversity and the evolution of sea temperature over a period of more than 140 million years. The research, led by Dr Jeremy Martin from the Université de Lyon, France and formerly from the University of Bristol, UK is published this week in Nature Communications. Today, crocodiles are 'cold-blooded' animals that mainly live in fresh waters but two notable exceptions, Crocodylus porosus and Crocodylus acutus venture occasionally into the sea. Crocodiles occur in tropical climates, and they are frequently used as markers of warm conditions when they are found as fossils. While only 23 species of crocodiles exist today, there were hundreds of species in the past. On four occasions in the past 200 million years, major crocodile groups entered the seas, and then became extinct. It is a mystery why they made these moves, and equally why they all eventually went extinct. This new study suggests that crocodiles repeatedly colonized the oceans at times of global warming. Lead author of the report, Dr Jeremy Martin said: "We thought each of these evolutionary events might have had a different cause. However, there seems to be a common pattern." 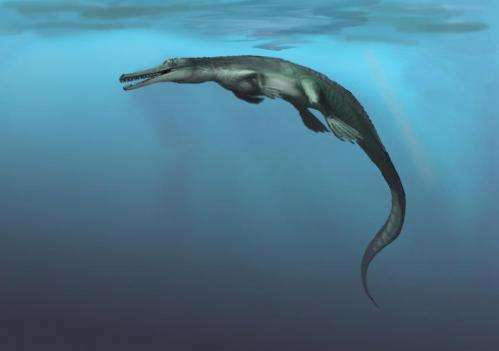 Dr Martin, with a team of paleontologists and geochemists from the Université de Lyon and the University of Bristol, compared the evolution of the number of marine crocodilian fossil species to the sea temperature curve during the past 200 million years. This temperature curve, established using an isotopic thermometer, is widely applied for reconstruction of past environmental conditions and in this case, is based on the isotopic composition of the oxygen contained in the fossilised remains of fossil marine fish (bone, teeth, scales). Co-author, Christophe Lécuyer explained: "According to this method, it is possible to calculate the temperature of the water in which these fish lived by applying an equation linking the isotopic composition of the fossilised remains to the temperature of mineralisation of their skeleton. The seawater temperatures derived from the composition of fish skeleton thus corresponds to the temperature of water in which the marine crocodiles also lived." The results show that colonisation of the marine environment about 180 million years ago was accompanied by a period of global warming of the oceans. These first marine crocodilians became extinct about 25 million years later, during a period of global freezing. Then, another crocodilian lineage appeared and colonised the marine environment during another period of global warming. The evolution of marine crocodilians is therefore closely tied to the temperature of their medium, and shows that their evolution and their lifestyle, as in modern crocodilians, are constrained by environmental temperatures. Nevertheless, one fossil lineage does not appear to follow this trend. 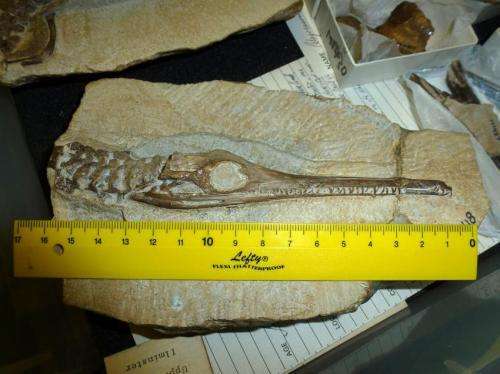 Jurassic metriorhynchoids did not go extinct during the cold spells of the early Cretaceous, unlike the teleosaurids, another group of marine crocodilians. Quite surprisingly, metriorhynchoids only disappeared a few million years later. This exception will certainly provide grounds for new research, particularly into how the biology of this group adapted to life in the pelagic environment. Professor Michael Benton from the University of Bristol, another co-author of the study, said: "This work illustrates a case of the impact of climate change on the evolution of animal biodiversity, and shows that for crocodilians, warming phases of our earth's history constitute ideal opportunities to colonise new environments."